The Basset Hound Club of Southern California Inc. officially became a club in 1951. It is a licensed Club of the American Kennel Club. AKC licensed clubs meet certain requirements to be able offer events which are in all respects identical to AKC member events, but licensed clubs do not have delegate representation at AKC meetings. 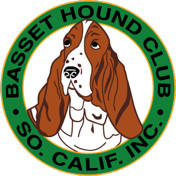 It is important for people to note that the Basset Hound Club of Southern California, Inc. (BHCSC) is a member club of the Basset Hound Club of America, Inc. (BHCA). In addition the BHCA is a member club of the American Kennel Club (AKC) with an AKC delegate. The AKC was established in 1884 as a registry of pure bred dogs. Dogs that are registered by the AKC are the prodigy of purebred ancestors that are all registered with the AKC. AKC registration assures buyers that the dogs are purebred. The AKC maintains a "stud book" for each breed that records all breedings starting before the breed was officially recognized by the AKC. The stud book records for Basset Hounds go all the way back to 1884. In addition to the registry the AKC sanctions many different kinds of events and titles for dogs. The events include dog shows where the conformation of the dogs is judged by AKC licensed judges according to a written Standard for each breed. There are also numerous performance events that all dogs can participate in. The Basset Hound Club of Southern California, Inc. holds several of these events every year. In March we hold two conformation shows called Specialty shows because they only involve one breed, basset hounds. In conjunction with the BHCSC Specialty Shows we sometimes have an additional conformation event, a Basset Hound Club of America, Inc. Regional. During the year, usually in the spring and fall, the BHCSC hosts AKC Sanctioned B Matches. We have classes for puppies and young adults as well as a separate match for veterans, age six and above. We also hold classes in obedience at our specialties. In 2015 the BHCSC added classes in AKC Rally to our specialties as well. Each February and again in November the BHCSC holds field trials for basset hounds. This is an event where owners can test their basset's ability to track the trail of rabbits. At various times during the year the BHCSC also offers testing opportunities for the AKC Canine Good Citizen (CGC) title. We also plan to add testing for the new AKC title, Trick Dog in 2017. Our club would not exist without the support and work of our responsible breeders. These dedicated basset hound lovers work hard to put on our events. They also are contributing to our wonderful breed by doing their best to breed basset hounds based on the AKC Standard for Basset Hounds snd follow our BHCSC Code of Ethics. To find out more about responsible breeders check out our information here. We invite all lovers of basset hounds living in Southern California to join our club in its efforts to educate the public about our wonderful breed and the concept of responsible breeders (LINK: Membership Information). Note: BHCSC, Inc. is a not-for-profit 501(c)(7) organization. LINK: How to get started showing your Basset Hound.